Winston Brassington has given up his job as Head of the National Industrial and Commercial Investments Limited (NICIL), according to a Finance Ministry spokeswoman. She said Brassington’s contract expired on December 31, 2015 and he formally indicated that he would not be renewing it. That disclosure came hours after Demerara Waves Online News first reported that as of 20th January, 2016 Brassington became the President of A 1 Pallet Supply Inc; a company based in Florida. 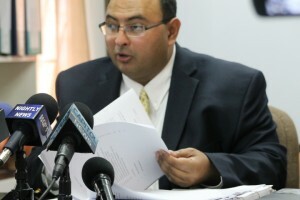 Government had announced that Brassington had been sent on administrative leave to make way for another audit by the Auditor General’s Office and a police probe into alleged financial irregularities that had been uncovered by Forensic Auditor, Anand Goolsarran. Brassington had been due back around January 23, 2016 at the end of his vacation leave, but one day after he left Guyana the government announced that he had been sent on administrative leave. Brassington had been head of NICIL and the Privatisation Unit since 1994. The opposition People’s Progressive Party Civic (PPPC) has accused government of witch-hunting Brassington and several other persons who have been perceived as supporters of that party, its programmes and projects that it had crafted and implemented while in government. For its part, government has vowed to go after several persons as part of anti-corruption crusade. A Guyana Defence Force (GDF) Intelligence operative and his wife lost their lives in a vehicular accident on Carifesta Avenue, Georgetown while attempting to intercept a car that they had erroneously thought had been ferrying Brassington’s family members. The botched operation began on Cowan Street, Kingston outside the home of Charles Ramson Jr; one house west from Brassington’s home. Police from the Special Organised Crime Unit (SOCU) have since carted off a huge quantity of documents from NICIL’s office on Barrack Street, Kingston and changed the locks to Brassington’s office. The home of Deputy NICIL Head, Marcia Nadir- Sharma has been also searched. Prior to leaving Guyana, Brassington had professed his innocence. “As far as I know I have not broken any laws and if Mr. Goolsarran is suggesting it then I believe I have a clear defence on why what we did was properly done and we should not be held responsible,” he has said.